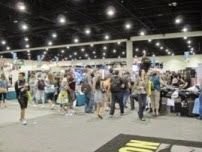 If you're lingering in the SDCC online world right now, you've probably seen at least a dozen articles titled "What to Pack for San Diego Comic-Con." I always want to skip posting this kind of thing because most of you have been to the Con before and also, you're not stupid. At the same time, every year I hear "I should have brought..." or "No one told me..." from first-timers - and even veterans forget the basics. So here we go. What should you pack? #1. Something warm to wear. As I said a few days ago, San Diego nights can get chilly in my thin-blooded opinion. If this is you, bring a sweater or jacket. If you're going to camp under the stars, layer up so you can be toasty at night and then strip down when the mornings turn hot. #2. Something comfortable to wear. 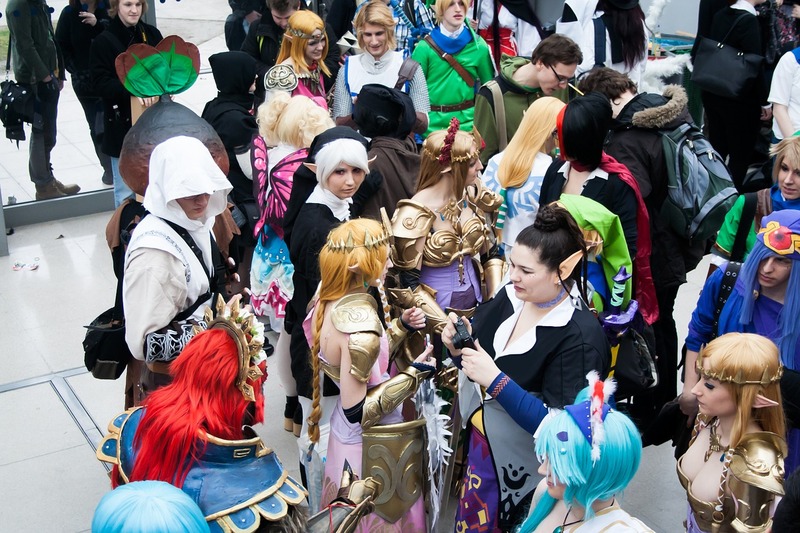 You may be getting spiffed up for some kind of glittery event; maybe you plan on living in your cosplay. Even so, the time will come when you just want to be comfortable. 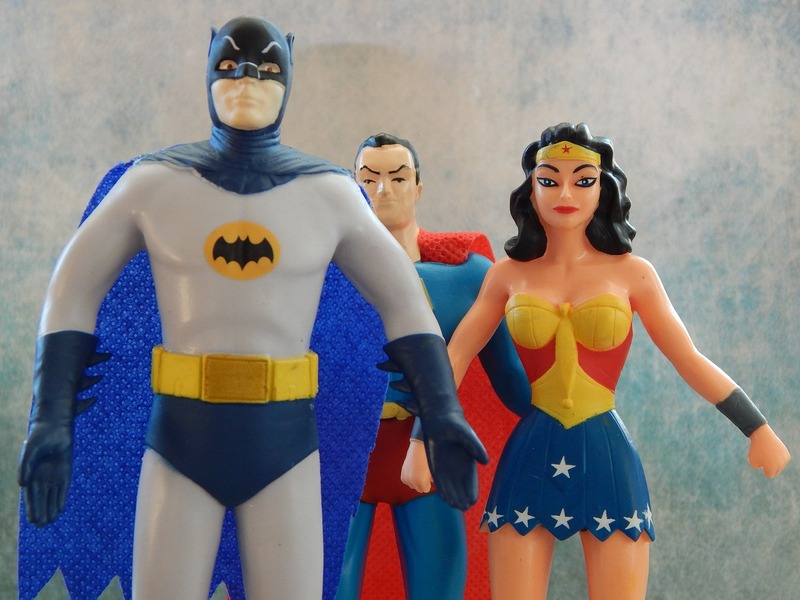 Think you're too vain to look schlumpy at Comic-Con? After a few days and lines, you won't care. #3. Portable chairs or air hammocks. Speaking of comfortable, If you're serious about your line time, come prepared. #4. Cosplay repair. Wigs, weapons, armor, dresses, zombie makeup wounds - they can go awry so quickly. Bring an alternate costume or repair tools and sewing kits. #5. Extra batteries, headphones and portable chargers. Don't count on charging up when and where you need to. It's faster and more reliable to just pop in a fresh battery or use your own charger. #6. Contact cards. Even if you're not marketing yourself in some capacity, you will meet people you want to stay in touch with. Bring something that can be quickly exchanged instead of making someone unlock their phone and type in your number. #7. A big tote or bagpack. The SDCC bags are great, but a bit too unwieldy for most of us to carry around. You'll do better with a huge purse, tote or backpack - anything that doesn't fit in can go to Bag Check. #8. A moderate number of devices. 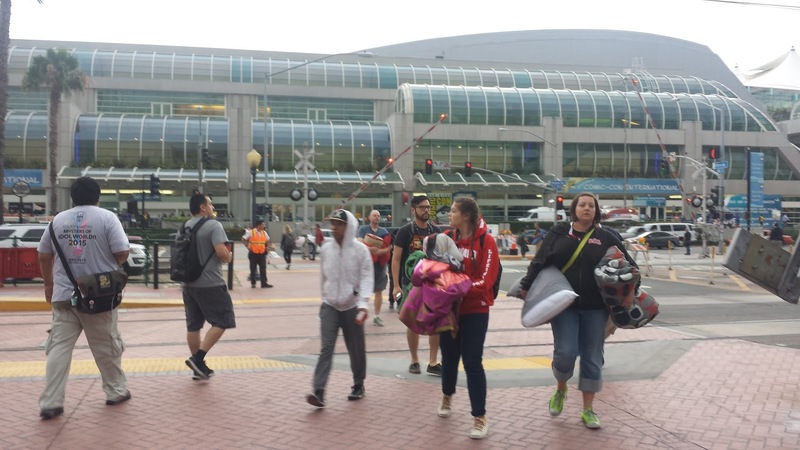 Do you really need your laptop, camera, phone and iPad at SDCC? I'm going to say you can get by on 2 of those. Don't weigh yourself down. #9. Food and water - if you're driving. Even if you intend to eat out for every meal at SDCC, it may not always be an option. Having power bars, fruit or what have you can get you in line earlier as well. #10. A hard copy of your friends' contact info. In case you lose power or Internet - it happens. Or you're just Twitter friends with someone and they're offline and you can't text them and oops, there goes the Conan ticket they promised you. #11. A list of everything you promised to pick up for your friends. It's just easier instead of running through text messages from 42 people, trying to remember who wanted what and where you can find it. #12. Aspirin, band-aids, eyedrops, condoms, sunscreen, drugstore cures. 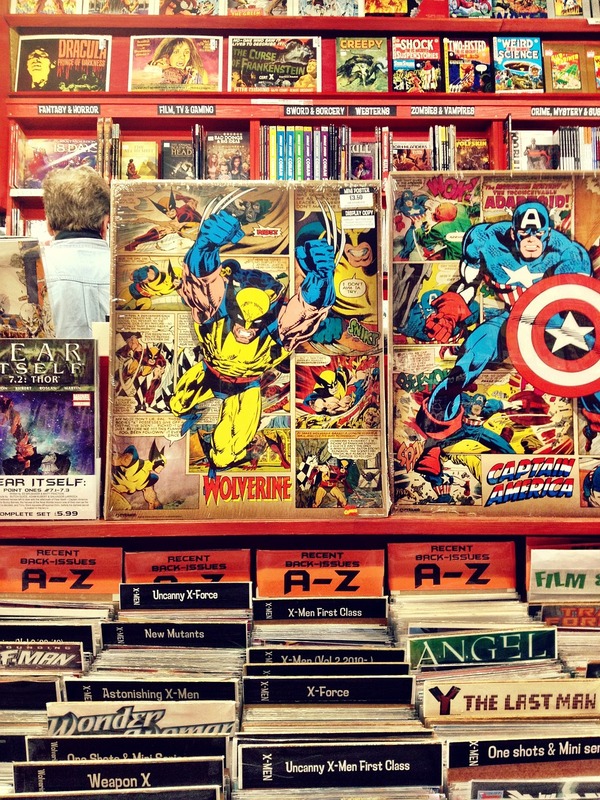 Travel can do a number on many of us, but add in the noise and stress of Comic-Con and you could be waylaid by headaches, constipation, dry eyes and other ailments. Sunscreen is mandatory; antibacterial gel is also a good idea. Can you just buy all this stuff there? Yes, but traveling to CVS is another task you'll be too busy for - and hotel gift shops will charge you a mortgage payment for 3 ibuprofen, in addition to closing early. #13. Earplugs and sleep mask. These aren't just for ladies of leisure who sleep till noon. If you don't sleep well in hotels or are sensitive to city noise, earplugs and sleep mask can help you get genuinely restful sleep. I travel with an entire insomnia kit involving melatonin, lavender oil, 2 pillows and a white noise app. #14. Sketchbook and writing implement. If you want to collect sketches, don't settle for the back of a promotional flyer. Bring a nice sketchbook and sharpie and use it for multiple Cons. #15. A regular book. This may seem like bringing sand to the beach, but you will find yourself with more reading time than you think. Even if you buy a stack of fresh comics, do you really want to read them all in the Ballroom 20 line? Bringing a paperback will keep you from running down your phone, too. #16. Bathing suit. Even if you don't want to visit the beach, just getting in your hotel hot tub or sauna is a nice break from the Con. #17. A water bottle and portable snacks. 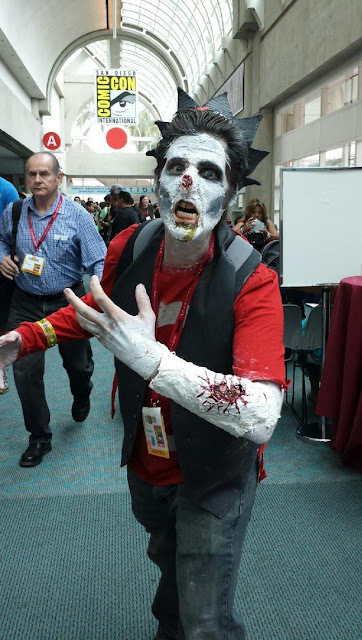 Comic-Con is really dehydrating, so get in the habit of carrying a bottle around that you can keep refilling. You can also avoid a two-hour lunch disruption by bringing a sandwich or power bar. #18. YOUR BADGE. There aren't enough panic attacks in the world for the moment you step off the plane and realize your badge is back home in South Dakota. Also bring a lanyard, even if you intend on buying a new one. Don't try to pin your badge on, that's an invitation to disaster. A ton of different outfits and shoes. You can probably get by on your support shoes and one pair of going-out shoes. Shipping materials. The convention centers and nearby hotels have UPS or Fedex stores to ship your stuff home - and they'll have all the boxes and tape you need. 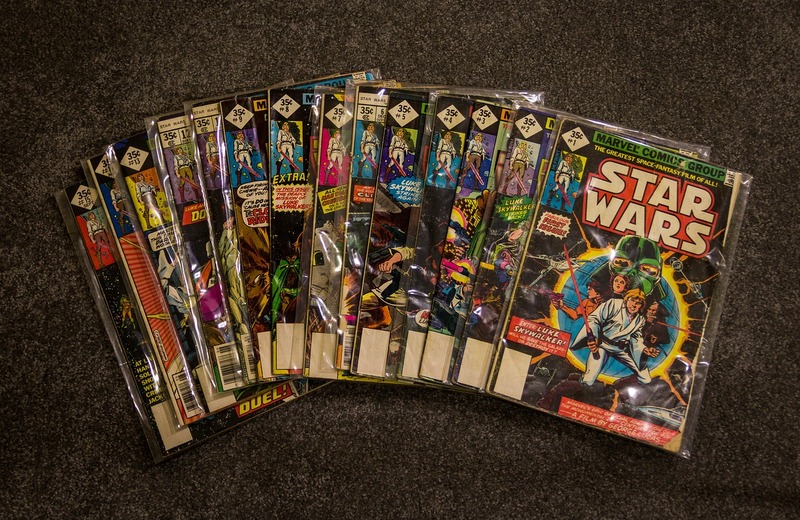 An entire of suitcase of back issues and old action figures to sell. The vendors aren't interested unless you've got something super special.